The Roskamp Institute is devoted to understanding causes and finding treatments for brain disorders and addictions. We are a world renowned team of experts from all over the world working tirelessly on our research. Staff members of the Institute have offered educational presentations throughout the Sarasota and Manatee areas, and are ready to do so for your group or facility. The Roskamp Institute has been working on novel treatments and research for Alzheimer’s, PTSD, TBI, and other brain diseases for over 10 years. You can join our elite group of Alumni with a Ph.D in neuroscience, with real world training at our facility in Sarasota. The mission of The Roskamp Institute is to conduct scientific research to discover safe and effective new drug therapies to treat diseases of the mind and to promote healthy aging. Headed by Drs. Fiona Crawford and Michael Mullan, the Institute employs experienced and scientists and technicians and houses state-of-the-art research labs and equipment to conduct scientific research. The quality of research performed at the Institute reflects our motto: Better science. Real discovery. 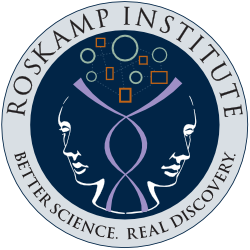 Most of The Roskamp Institute’s funding comes from grants and the general public — people like you. Your gift makes a difference in the lives of people facing diseases such as Alzheimer’s Disease, Head Trauma, Drug Addiction, Cancer and Tourette’s Syndrome. The Institute has a goal of increasing public awareness about research into neurodegenerative disorders and addictions. We offer free seminars and hold talks at events at our location and around the country. We love serving our community. The Roskamp Institute, in partnership with The Open University, UK offers a doctoral degree in Neuroscience. The Open University is the awarding institution for the Doctorate of Philosophy degree. From our research, community events, letters from our executive and more, the Brain Waves Newsletter is your inside scoop for all things at the Institute.